More than 20,000 motorsport fans are expected to descend on north Wales to watch Saturday's Cambrian Rally. It starts in Llandudno as the opening round of the British Rally Championship, the only stage in Wales. It is the first time in the Cambrian Rally's 64 years that it has served as a British championship stage. 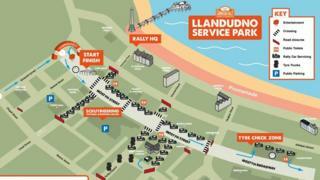 The race starts on Llandudno promenade with forest stages in Snowdonia, Conwy and Denbighshire where the biggest crowds are expected to watch. Colwyn Bay's Matt Edwards, who is defending his 2018 Motorsport UK British Rally title, said organisers had "worked hard for a number of years to make the step up to the British championship". "It's great for the profile of Llandudno...and rallying in the area as a whole," he added.